Medium - €52.99 Only 1 left! Never send a man to do a woman's job and don't even think about sending two superheroes to do a woman's job! Batman and Superman don't have a chance of taking down Doomsday without the help from the golden-lasso-swinging Diana Prince! Wear this deluxe Dawn of Justice Wonder Woman costume to look mighty enough to take down a Kryptonian monster yet beautiful enough to attend a party at Lex Luthor's mansion. 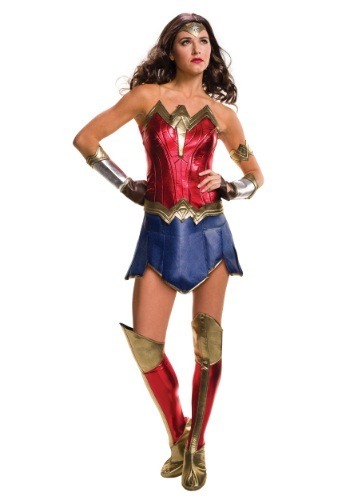 No matter if you want to take down criminals or party with the best this Halloween, this Wonder Woman costume will get you ready to play the role of superhero in no time! Wonder Woman’s look is continuously evolving, and while the classic Wonder Woman look is always stunning, the newest iteration of her costume will leave superheroes and supervillains wanting more! This officially licensed Wonder Woman costume is from the Batman v. Superman film by Zack Snyder and comes in a variety of sizes to perfectly fit your superheroine size and style! The dress is accented with Wonder Woman’s classic gold belt and the traditional blue and red colors. The included arm band , gauntlets, and boot covers finish off her signature look. And who would Wonder Woman be without her golden headband? Definitely not the Wonder Woman we all know and love – so the headband is included, too. Pick up a golden Lasso of Truth so that you can take down the bad guys (and gals) this Halloween in record time. Because even a new look needs a classic accessory!